Come see a new painting of an incredible creature: a White Bison. Come follow this turtle's transfomation! A post about finding out what your "Spirit Animal" is. Hello! I wanted to write this message to let you all know what I've been up to with my art this year! In these small paintings, I create animals with qualities that I admire. I am in love with creating a sense of movement, using swirling brushstrokes and layers of translucent glazes. While I admire all animals, I began painting animals that I often see at my home by the river or at the lake in Minaki. Some of my favourites are: owls, foxes, wolves, eagles, hawks, otters, deer and bears. I can’t get enough of bears and owls! I soon found out that a lot of people love these animals too! And in these paintings it isn’t just about recreating nature, it is about creating an emotion or feeling. When I am working on these Spirit Animals, I feel both calm and a sense of energy. When I'm painting them, all feels right in my little corner of the world. This one is still available! 40 x 40"
A sense of calm and energy is something I think a lot of people want in their lives. My hope is that someone looking at my paintings can feel a sense of that. Maybe having a painting of mine in their home can give them a feeling of peace, happiness, and beauty, a little bit every day. Every painting that I create is deeply personal to me. Often when I’m working on a painting, I will have a word, message, or feeling that I think of as I’m working. With each new piece this year, I’ll have a small note, wrapped around a feather, twig, or inside a tiny glass bottle. When you take home a painting of mine, you can read this message and know what I was thinking of while working on your painting! Also, my paintings have started to grow in size! I’ve worked on paintings that are 24x48” 20x 40" and 40x40”. I know I will continue to go larger with my art because it is amazing to capture the size of an animal on a larger surface. The sense of movement that you can get is incredible! In all honesty, I’ve become more confident with my painting as a result of every person that has ever commented on my art or purchased one of my paintings. As much as I love painting for myself, I cannot express how much I am encouraged and motivated by the feedback from others about my work. So, Thank you! I am pretty excited to see where these Spirit Animals will take me. P.S. I’m going on a trip to Hawaii in the Spring and my hope is that I will see a Sea Turtle., which I will create a large painting of. Wouldn’t that be amazing? I wonder what else I will see. To see which paintings are available, please visit my Gallery page. I am also more than happy to create custom work, so please feel free to send me a message from my Contact page. Episode 4 of Lynn and Lemon's Adventures! “Brrrrrr!” Lemon shrilled as he clutched the reigns close and shook his head! “It's getting chilly", Lynn agreed. Lemon carefully tacked up a poster to an old oak and the two stood back, admiring their work. Throughout the woods, they had hung up nearly a dozen posters. Eleven to be exact, because one got caught up in the wind and blew past the river bank. They were hoping to hear back from anyone looking for a missing creature and the whole crew at the Workshop would do their very best to bring the lost one home. "Red fur, a green hat, a purple scarf, and missing a tooth". Flick “had a feeling from the tip of his nose to the end of his bushy tail” that the mouse might be field, beyond the woods. To get the field, they would need to cross the road. Lynn looked back at Lemon and instantly they knew what each other was thinking. To get the field, they’d risk being hurt by the monsters. If they took too long crossing the long stretch of road to the field, they could be hit by the shiny, gigantic, mechanical animals that fly by at lightning speed. Lemon was already shaking in his saddle. Maybe it was too dangerous. Perhaps they should just stick to searching in the Woods and not risk going into the field. A small voice piped up. All heads turned towards Whisper, who was peeking out from the pack on Iris' side. Iris said not a word, but closed her good eye and nodded. Even though Iris is new to the Workshop, the others could not question her strength and swiftness. After packing a few supplies, Whisper and Iris were prepared to go. "Please be careful!" Lynn sang as the two made their way past the workshop and the woods. Flick waved his wand and hollered"Do be careful!" and Lemon shivered once more in his seat. Hours passed and the day wore thin. Iris and whisper had not yet returned. Lemon, Lynn, and Flick kept watch and gathered firewood to pass the time. Flick considered adding his broken wand to the heap of sticks, but it felt like an old friend to him and he decided against it. As they worked, Lemon hummed nervously, trying to fend off bad thoughts of those monsters and whether or not their friends were safe. "Have you ever wondered why Iris always keeps one eye closed?" Flick huffed as he waddled towards the pile with a heavy twig. Lynn opened her mouth to answer but before she could say anything, she was interrupted by Lemon "SHHH....."
Lemon sat up tall on the saddle and his ears perked up again when he heard a high pitched squeal! Sure enough, Iris and Whisper were slowly making their way to the workshop, pulling something behind them. Whisper called out: “We found the missing mouse and two more!” They’d never heard Whisper sound so excited. She was practically bouncing out of the pouch on Iris' side. Flick helped to remove the leather strap from Iris's shoulders. She stretched her back and sat down in the soft moss. Lynn gazed down into the bundle that iris had pulled home. Not one, but three Mice were curled up inside! The three of them were huddled together, two grey and one red. The little grey one on the left had on a green hat and the one on the right was wrapped up in a purple scarf. The little red one in the middle had not a scrap of clothing, but looked cozy and warm between the other two. He must have shared his clothing with his friends. He smiled shyly and it was true, he was missing a tooth! "Hello, I'm Lynn", she said softly. "We're happy to have you here". That night, three rested in a nest of wool and were lulled to sleep by the hooting of an owl. Before going to sleep, Iris brought Whisper over to say goodnight to the three. Maybe they would dream of all the places they would see tomorrow. Lynn and Lemon, they are not your average pair. Lynn, being and llama, and Lemon, a lemming, they are quite a sight wherever they go! Lynn has left her pasture far behind and Lemon has fled his slice (did you know that's what a group of lemmings are called?). Now they've ended up in this little piece of paradise. Together they wander the Workshop in the Woods to make sure all is in order. What do they see? You'd have to ask them. But I'd imagine that birds with broken wings, fallen trees, and interesting varieties of wild mushrooms are some of their regular sights. Today, was their very first day on the job! While in the back woods, they heard a thin, distraught voice. Up on stump, they saw him, dressed in a cape and flicking a small twig in the air! As if defeated, he said "What's the use!" and slumped down into the moss. It was a frail, aged raccoon named Flick. Lynn and Lemon found out that he was lost and that his magic twig was broken. All it would do is light up a faint shade of green and fade out again. He could not get back to where he was from. He said it is important to return soon because he needs to watch over a child's room and fend off bad nightmares. What good could he do here, out in the woods? Until Flick's wand starts working, he will join Lynn and Lemon. They will go in search of other creatures during the day and will sleep in the Workshop at night. Check this blog post often to see who else has been found! Please click on the contact button at the top of the page to send me a message about Flick! Also, check out the "Little Lost Ones" page to see who else is available for adoption! Here are a few new paintings, fresh from the Workshop! All of these paintings Are available (except maybe the bear!). Please let me know if you are interested in any of these. I am also more than happy to take custom orders of Spirit Animals too! These are all 8x10" Acrylic on canvas and I can create larger sizes as well. Thanks so much for taking a look at what's new from the Workshop! I will be posting the painting of the winner from the "Spirit Animal Contest" next week! My artwork is deeply inspired by nature and animals. Come to think of it, it always has been. Lately, as often as I can, I will go out in my kayak on a peaceful morning at the lake and just look and listen. If I am quiet, I see small things that I might normally pass by and I can get closer to animals. I remember slowly moving towards a young, bright orange deer, who kept dipping his head under the water and happily munched on some reeds. He didn’t seem to mind that I was ten feet away. Another time I sat in a bay with Kent while two eagles swooped above. At times like this, I feel like I am recharging and gathering energy and inspiration for new artworks. 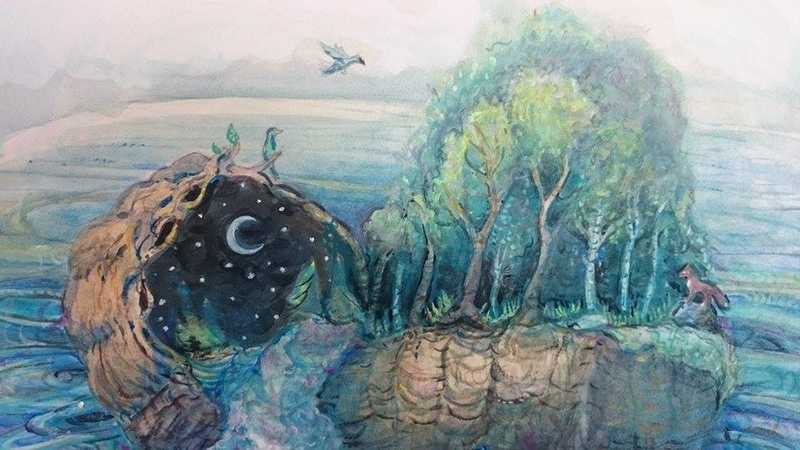 Along with animals, my dreams are also a large source of inspiration for my paintings. Bears were a reoccurring emblem in my dreams as a kid/teenager. Over the years, I probably had several dozen. It really intrigued me and led me to thinking about Spirit Animals. Some people say that it is representation of the traits and skills that you are supposed to learn or have. Consequently, your animal is not something you pick, but is something that chooses you. Deep in my subconscious, I think there is a bear roaming around. The dreams most often began with me looking out the cabin window towards the lake and the point (the edge of the rocks at the end of our little bay). My heart would sink when I spotted that dark shape, slowly lumbering towards the cottage. It was never a surprise, because I knew it was there anyways, but I rushed as fast as I could, shutting all the windows and locking all the doors. I would find a hiding spot in a closet or under a bed. Sometimes I would hurriedly leave dishes of ice cream and chips, hoping that it would fill the bear’s belly and he would no longer be interested in devouring me. Within my dream-induced panic, I’d be waiting and wondering which window he’d be peering in, but was pretty sure he knew exactly where I was. These dreams happened every few months and they followed the same plot. Me spotting the bear, locking up the cabin, hiding, and feeling a sense of dread. Sometimes the bear broke into the cottage, and growled and pounded at the bedroom door, but I usually woke up before actually facing it. One dream was different. I went through the usual routine of spotting the lumbering sillhouette in the distance, panicking, racing through the cottage and waiting for its arrival. This time, despite having all the windows and doors shut, it appeared right in front of me in the living room. It looked right at me. I waited, fearing the worst. It slowly turned and vanished. It left me with a feeling of “is that all I needed to do all this time? I just had to look at him?” After facing this bear, I have not had a bear dream since. A few times it has been replaced with a wolf, but never a bear. I have often thought of these dreams and wondered what they meant. I know that it has something to do with how I need to face my fears. But is the Bear my “Spirit Animal”? I looked up the meaning of Bears as Spirit animals. It is representative of “inner strength, fearlessness, and confidence”. It is also a guide to take a leadership role in your life. Maybe the aspects of myself that were lacking are the ones that the bear represents. 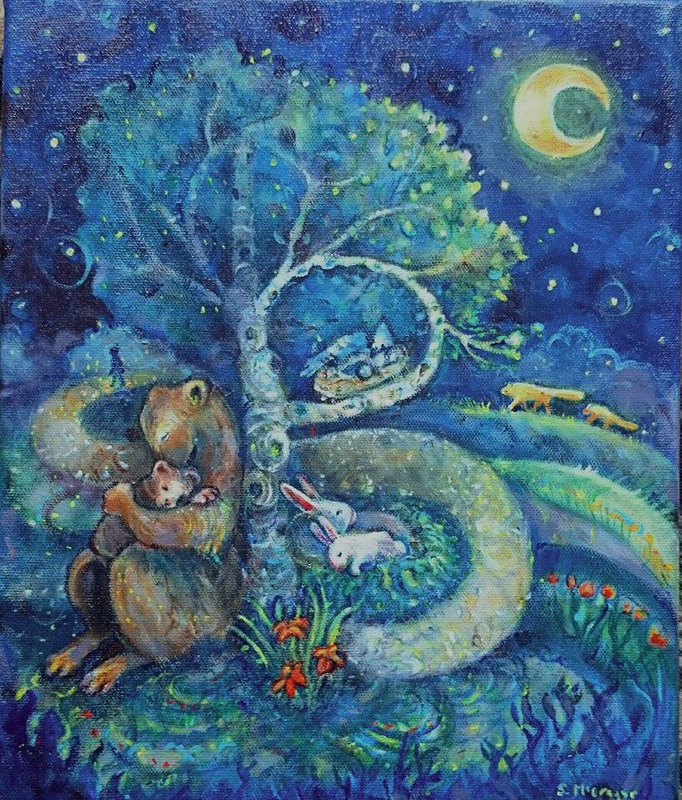 I did this painting to represent the bear and the qualities that it possesses. In hanging up this painting, it will be a reminder that I need to find my own inner strength and confidence. What would you like a painting of? I have started painting a series of Animal Spirit paintings: 8x10” Acrylic on canvas. I want to see which animals you would want to see paintings of. Please leave a comment on my blog or Facebook post, saying which animal you think is your “Spirit Animal”. If I get at least 25 comments by Friday, I will draw a name from a hat, and the winner will get a painting of their Spirit Animal! As a kid, I had two main things that I loved to do: drawing and Irish Dancing. I was drawing from the time I could pick up a marker and dancing since I saw Riverdance at age 11. These two interests took up most of my free time and I loved it. Instead of watching tv, I’d draw for hours in my room, and instead of sleeping in on the weekends, I’d be in my basement at 7:30 practicing (I think I only practiced soft shoe in the morning, so everyone else could sleep). From this time I have books full of my practice notes, i was twice as dedicated to irish dancing than I am to CrossFit now! There were many things that I loved about Irish dancing and one of those was, without a doubt, the dresses! If anyone has ever seen an Irish Dancing dress, you know that they are a sight to be seen! They are full of intricate designs, formed from embroidery, fabric appliques, and rhinestones. The designs originally were inspired by the Book of Kells, but they have become much more stylized over the years. My dream was to own one of these dresses, but I knew I had to earn it. I’d be practicing in my basement for hours, thinking of the next competition and hoping that I could get my own Irish Dancing dress soon. I attempted drawing these celtic knot designs in my sketchbooks and i found them really challenging! I saw that these designs sometimes included animals, usually hounds. I was pretty pleased with this celtic hound that I drew. Then, for a reason unknown, I combined celtic knot patterns with all three of my sisters’ cats. They were Celtic Cats! I think my sisters liked them, so I drew more Celtic cats. The crowning touch was the tail. It always had a "triquetra" shape. I was 13 years old and my family had just bought our first computer. An Irish dancing friend of mine had a website about dancing and she showed me how to set up my own website. I posted tips about Irish dancing and posted pictures of me and my friends at competitions, etc. Then, I had an idea! I would post pictures of my Celtic Cats. Then I would make a form that allowed people to order their own Celtic Cat! They could type in the colour and pattern of their cat and they would also include details about their cat’s personality. I was so excited when I opened my email and saw that I had my first Celtic cat order! I got to work right away. I would scan and email the Celtic Cat or in some cases, I think I mailed them. I kept on getting more submissions! 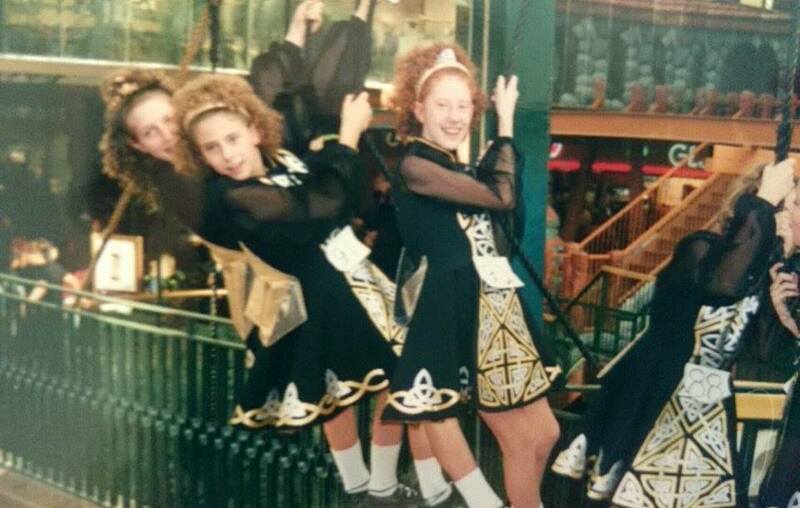 They were mostly Irish Dancers who had stumbled across my website, but they were from all over the world! Now I may have had a good little business, but I wasn’t charging anything for these Celtic Cats. It simply made me happy to create these images that made people happy. I really enjoyed it. You can leave a comment here, or on the Facebook post, and I will post the winning cat on Wednesday! This Christmas was really special for me and my whole family. We welcomed a new family member, Benjamin Micah English on December 15th. He is the first grandchild of the family and I could not be happier to be an aunt! I don't think I've ever seen something more beautiful and I will probably not again until one day if I have my own baby. How can something be so perfect? I wanted to make something for Benjamin that he could look at for years to come. I hope that when he looks at it, he will know how much he is loved! I wrote a poem to go along with the painting. and make an imprint that is entirely unique to you. I hope you know that you are always loved. I cannot wait to get to know Benjamin more and be a part of his life! What an adventure being an aunt is going to be! If you had asked me as a little girl about what I wanted to be when I grew up I probably would have responded with “an Artist or Veterinarian”. Making art and interacting with creatures has always been a passion of mine. Not much has changed! Now, if you had told my teenage self that in the future I would be a teacher, I probably would have looked at you with a confused expression. Being one of the quietest girls in school, I could be found working endlessly on my many art projects and avoiding having to speak in class. I was drawn to art is because it provided a way of expressing my individuality and talents, but in a way that was safe to me. I could look at an object sitting in front of me and recreate it in my sketchbook. Or I could take something entirely from my imagination and make it come to life on a canvas. I could even take some clay and some scrap materials and pretty soon there would be a weird and wonderful creature sitting in front of me. I did this for myself because it was what I loved to do. Art gave me a chance to shine when I was so compelled to fade into the background. Despite my shyness, I always liked to challenge myself. Whenever I felt nervous, “Just do something that scares you every day” was what I repeatedly told myself. Sometimes I felt like the most scared brave person in the world. Other times I felt like most brave scared person. Somehow I managed to intertwine being nervous, yet having the desire to do well and not letting my fears stop me. There was never a question that I loved art, but it took me a long time to consider teaching. As a teen, it never crossed my mind that I might step from behind that desk to the front of the classroom. Yet, here I stand as a first year teacher! Let’s take a few steps back to see where I started. I vividly remember the second thoughts running through my mind the day before my first practicum. I was preparing for my first art lesson to 34 Grade 9 students and panic set in. Having a vivid imagination, it was like all the possible negative scenarios rolled through my mind like a bad movie. I don’t think I even slept. The next morning, I got up, drove to the school and bravely gave my lesson, which I still cringe to think about. This was so out of my comfort zone. I thought maybe I should just go back behind my watercolour paper and my paints, maybe that is where I belong. But I had this nagging feeling that I couldn’t just give up and that maybe I have something valuable to learn or share with continuing this path. The course of my whole first practicum had to have been one of the most challenging and stressful times for me, as I tried to shift roles from being student to teacher. I wanted so much to be perfect, but I couldn’t be. With paint, when you mix yellow and blue, you know you will always create green. I know that I can create depth on a page in the way that I apply specific colours. This is what I do; it’s what I know. But, with teaching, you may plan meticulously and for dozens of different reasons, the outcome is completely different than you had imagined. Here were 34 individuals, all with different personalities and needs, and who knew what they were going to do! It made me feel very uncertain. But, it was time for me to step back and realize that all the mistakes, awkward moments, and feelings of uncertainty were only small blips within the larger picture. It was all a part of the process of becoming a teacher. Am I ever glad that I stayed put and showed up day after day, willing to try again. My second practicum I felt a change happening I was becoming more confident, and better able to connect with students. I was letting my mistakes roll off my back and seeing every day as an opportunity to try something new. I am proud to say that I have my first teaching job and that I truly love it. The things that I love about my job are not always the things that I would have expected. I quickly realized I am not here only to train artists. Every day I see these kids they show me what it means to be a teacher. Patience, empathy, and flexibility, to name a few. I can see reflections of myself in some of the students and I know what they need to be successful and to feel cared about. Then I have other students who are like puzzles and challenging, but equally wonderful. Of course, some days I need to remind myself of that. I like to think that teaching is an art and right now I’m a novice. I have so much to learn and I often worry that I could be doing more. Maybe one day I’ll make it to Da Vinci status, or maybe just Stephanie level. All I know is that I will bravely continue teaching and creating my own artwork, for myself, my students, and everyone around me. I smile, thinking of the surprised look on my fourteen year old self if I were to tell her that not only am I an artist, but also a high school teacher. I imagine thinking she would be a little bit proud. This post strays a little farther away from what I usually write about in this blog. It is something important to me and I find that it relates to many aspects of my life and is probably something you can relate to, even if you have never tried CrossFit before. How do you define strength? Is it how much you can lift at the gym? Is it is how far you can push yourself through difficult situations or overcome obstacles in your daily life? Is it about getting past those unhelpful ways of thinking that hold you back? I think everyone has their own idea of what strength is defined by. I believe that it is a combination of those and many more. Part of feeling strong for me is how far I can push myself at the gym. I'm drawn to gymnastics because not only does it require a lot of strength, it is also amazingly fun! Included in this are many different movements on the gymnastics rings, such as muscle-ups. When I first started crossfit, muscle-ups seemed like the epitome of strength and control. This is a movement where you start with the rings within arms reach above your head. You pull yourself up, to the point where the rings are at your chest and lean forward, arms bent. Then you push yourself up, straightening your arms. Despite it being a fairly basic gymnastics movement, it is incredibly difficult when you are first learning it, especially if it is done strict, instead of kipping. Getting my first muscle-up took me by surprise. I had been working on L-sits on the rings and paralettes every single day for months to get stronger, but I didn’t have the guts to actually try a real muscle-up. I dutifully did ring holds and ring dips, practiced my false grip, but never really thought I would get a muscle-up anytime soon. Muscle-ups were for “strong” people and I didn’t think I was there yet. I had been doing Crossfit for almost a year before I tried doing a muscle-up. When I finally tried it for fun, to my surprise, I was extremely close. The next day I tried again and I made it through the transitions and I slowly and shakily got myself up and above the rings. One arm almost gave out and it was the equivalent of Bambi learning to walk, but I had made it! Anyone who has gotten a muscle-up will know the feeling. It’s like reaching the top of a mountain. I will never forget that feeling and I was walking on clouds for days after. When I got that first muscle-up, I thought to myself “Yes, now I am getting strong”. It started to become easier and I thought, “ok, maybe I AM strong!”. Being able to do this one movement almost became a defining feature of myself. It became a symbol of me doing something that I never imagined I would do. I did many, many muscle-ups, even weighted muscle-ups. I hung a pair of rings out in a tree and did even more. I did summer, spring, fall, and middle-of-a-blizzard-muscle-ups. Yes, even party dress muscle-ups. If I had a list of my favourite things, muscle-ups would be pretty near the top! For about a year and a half, I had a lot of fun doing muscle-ups. I felt defeated because I hadn’t struggled with them like this before. In my life, when I go through something that seems really hard, I often visualize the feeling I had when I got my first muscle-up and that really helped me with whatever situation I was in. But now my muscle-ups were gone. The crazy thought ran through my head “Maybe I’m not strong anymore.” I just wanted to cry. Despite feeling like I had lost something really valuable, I needed to take a step back. I can squat 200#, walk almost 20 feet on my hands, and do lots of other things that people might consider to be strong. I had improved in many other areas, but because of this one thing, I felt like I had lost a lot of my strength. It actually scared me. If you know me, you may realize that I am incredibly tough with myself and beat myself up for not trying harder or accomplishing more. I may have a smile on my face most of the time, but I am not always nice to myself when I should be. I had always bought into the notion that as long as I was improving and that I am better than I was yesterday, that was success. Sometimes you aren’t going to be better than you were yesterday, two months, or a year ago. You can’t possibly improve all the time with every single thing that you do. If you can, you are superman/woman and all the more power to you. I’ve changed the way that I look at strength. I’ve decided that as long as I keep trying to the best of my abilities, I am strong. I’ve decided it's time to be patient and go back to the basics. I’ll practice those L-sits, ring holds, and dips. I will get my muscle-ups back, if I work at it. But even if I don’t, I can still feel proud. It is not my ability to do any one thing; it is my perseverance, dedication, and positive attitude that makes me strong. There are many strong people in my life that I really look up to. I know that everyone defines what strength means to them, but I just want to say that I have a lot of admiration for anyone that keeps on going and never stop trying, whether it’s at the gym or in any other part of life. There are people who have illnesses, injuries, or other really difficult things to work through and yet, they keep doing what they can. It is often these people are the first to encourage others to keep on going and try to the best of their abilities. In whatever way you define strength, I hope that you are able to work towards it despite any setbacks you may face, however big or small. I've had 4 dogs now and they've all been rescue. Penny (a shepherd mix) was my first rescue. I was living in Cleveland and I had just bought a house....with the sole purpose of being able to finally have a dog. Two weeks after I moved in, I went to the Cleveland ASPCA with a friend of mine. My friend was wandering all the rows of dogs and she kept saying come and see this one, or you should totally pick this one. I had walked into the dog area and my feet felt like they were in cement. I couldn't walk any further than the first kennel. I couldn't move, I couldn't walk by all the kennels and just pick one. My heart was breaking seeing all those dogs in need of a good home. Penny was in that very first kennel. She was sitting quietly at the back of the kennel just looking. She looked so sad. I burst into tears and stuttered out that I was taking this one as I pointed to Penny. By the time I left I had all of the staff in tears as I was sobbing into Penny's coat. Fast forward a year and Penny and I were at the annual Humane Society walk. Penny found Rusty and it was love at first sight. He was a great big orange dog who turned out to be a rottweiler/golden mix; he had an adopt me sign on him. Penny and I didn't stand a chance, we left that walk with Rusty in tow. They were the best of friends. They both lived long lives, Rusty was 14 when he passed and Penny made it to the ripe old age of 16. Not a day goes by that I don't miss those two! Now I have 2 more rescues in my life; Roxy and Sam. Thanks Daria, for sharing your story about your dogs! Earlier this summer, I asked for submissions of your favourite summer memories. Thank you to everyone who shared, I really enjoyed reading them. I randomly chose a name and the winner received an illustration based on the story they submitted. "Summer time, and the living is easy. Fish are jumping and the cotton is high." My Father sang this song to me as a lullaby when I was a little girl and now I sing it every night to my two little boys. For me the living has always been easiest in the summer. Born in July, I have forever been a lover of fireworks, picnics, swimming, hiking, canoeing, strawberries, watermelon sundresses, bare feet and everything else summer has to offer us. I spent most of my childhood summers in at Victoria beach, where my grandparents owned a cabin. I loved it there, I loved the beach and the rocks which I thought were unquestionably mine. I loved the small candy store where I could buy a treat for a penny (imagine that!). I loved the treats that they are still baking at the bakery there, what I wouldn't do for A dream cookie. I loved riding the "beach bikes" up and down the winding and hilly roads. I even have a few scars to remind me of some of those rides. I loved poking around the bush on the "kiddie trail" behind the cabin, always finding an interesting insect, fungus or leaf. I have countless fond memories of that place. Unfortunately my grandparents could no longer care for the cabin and two years ago they sold it. I felt that along with the sale went much of my past and a piece of my heart. Now I am working on building new memories with my children. We took our first tenting trip as a family two weeks ago. The boys explored sand dunes, ate smores, splashed in the lake, threw rocks in the water, made fires and stayed up way too late. I love being able to share some of my favourite things with them. My favourite memory is hard to pin down. It is definitely either somewhere past the gates of Victoria beach, or lake side watching my boys and their Dad skipping stones. Thanks again Becca for submitting your story! I will likely have one more contest this summer, so watch for updates!